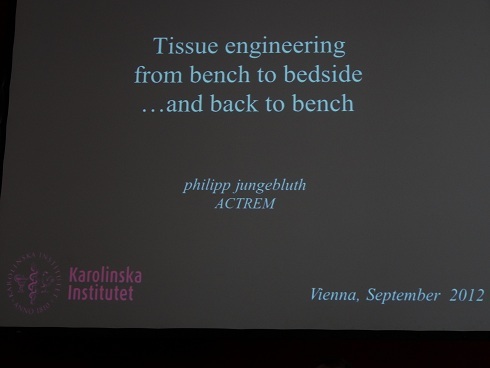 3-rd Tissue Engineering and Regenerative Medicine Congress (5-8 September 2012, Vienna, Austria) brought together more than 3000 scientists all over the world represented different fields. Scientific program included about 300 oral presentations and 1500 posters. The program reflects the rapid progress being made in this field during last 3 years, since the previous TERMIS congress. This year the record number of presentations described the clinical translation of Tissue Engineering and Regenerative Medicine. You could find sessions focused on enabling technologies, cell therapy, scaffold based therapy, gene therapy, biomaterials, and these sessions covered all organ systems including the musculoskeletal system, central nervous system, cardiovascular, gastrointestinal, and oromaxillo-facial tissues. Membership in TERMIS has experienced robust growth (more than 4000 by now) with equal participation from the America’s, European, and Asia Pacific chapters. Each chapter has strong representation at the Congress. The program also reflects the multidisciplinary peculiarity of regenerative medicine and at the same time - connection between basic and applied sciences. Several sections covered the basic issues of molecular and cell biology. Such as - Mechanism on Stem Cell Action (in coop. REMEDIC), keynotes: Paolo Bianco (Sapienza University of Rome, Italy), Frank Luyten (Division of Skeletal Tissue Engineering, KULeuven, Belgium), Katarina Le Blanc (Karolinska Institute, Sweden). REMEDIC is a Research Networking Program funded by the European Science Foundation. One of the central aims is to facilitate the exchange of ideas across disciplines in the regenerative medicine area. During recent years there has been considerable controversy as to the mechanism of action of cell therapies employing pluripotent adult stem cells. This symposium brought together leading experts in the field of regenerative medicine to discuss the latest developments in this current hot topic in stem cell biology. Mesenchymal & Stem Cell Therapy: Current Status and Future Developments: intensive research in academic institutions and small and medium sized enterprises tries to bridge the gap from bench to bedside by using mesenychmal cells for the treatment of degenerative conditions or trauma. The International Society for Cellular Therapy, which fosters applied research in this field, and TERMIS have joined forces to present an overview on the latest developments in the generation and application of mesenychmal cells for tissue repair and immunomodulation. Two keynote lectures focused on: the challenges and ways to optimize culture conditions for mesenchymal cells including transdifferentiation; and the safety aspects of clinical application of chondrocytes including genetic studies. Spotlight presentations highlighted recent developments to address neurological trauma via cellular therapy, to apply mesenchymal cells for immunomodulation and how to tackle the issue of controlled cell delivery. 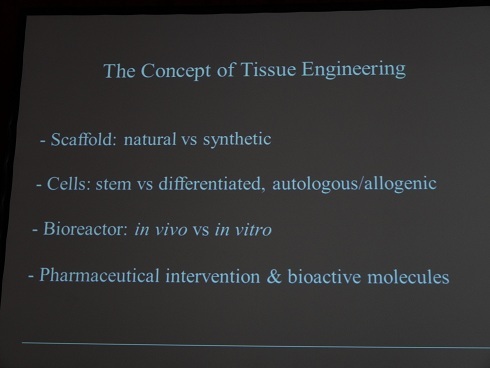 The concept of tissue engineering for regenerative medicine usually requires a multicomponent strategy including the application of biomaterials and cells. It has been shown that matrix mimicking the in vivo environment of the target tissue, including composition, organization, texture and mechanical properties is crucial for the behavior of the cells, to migrate, survive and take up their natural functions in the specific tissue. Cells and matrix originating for natural sources in particular human placenta and amnion should hence be able to fulfill these criteria and are promising candidates to stimulate the regeneration of tissues. Session Extracellular Matrix and Cells from Natural Tissues evaluated the suitability of these biomaterials processed from natural extracellular matrix and primary human cells including stem cells to promote processes of wound healing and tissue regeneration. The key tool of regenerative medicine: biomaterials, scaffolds and bioreactors’ technology were presented at the congress very well. Biomaterials are key elements in regenerative medicine, beside cells and signalling molecules: they allow or inhibit the attachmentor integration of specific cells, they can deliver drugs and mediators or can guide regeneration processes within the patients’ body. For these purposes new and functionalized materials with specific properties are under development, e.g. materials offering niches for stem cells and influencing their differentiation or materials delivering mediators on a specific signal from the surrounding tissues or only in a defined cell type. In some areas, e.g. the treatment of burned wounds, the former therapy with cultivated cells is today often replaced by a treatment with highly specific biomaterials giving even better results. The symposium Biomaterials for Regenerative Medicine focused on some characteristics that could be achieved by designing appropriate biomaterials and on methods to prove functionality and safety. Session 3D Scaffold/Cell Printing covered technological aspects regarding fabrication of 3D-scaffolds as well as the development of suitable biomaterials for scaffold fabrication. 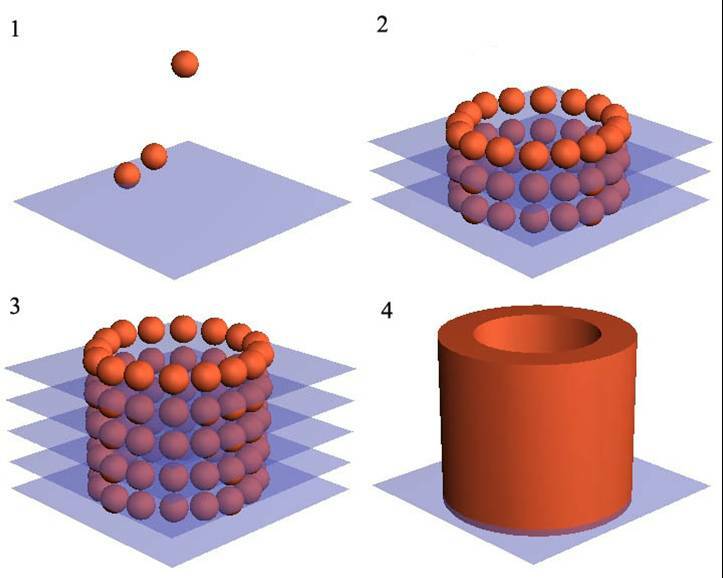 A special focus was on additive manufacturing techniques and techniques for cell culture in 3D. New methods, which allow the processing of biomaterials in the presence of living cells also were presented. Such as Laser fabrication of multi-scale elastic 3D scaffolds (Ovsianikov A, Dado-Rosenfeld D, Nurnberger S, Levenberg S, Redl H, Liska R, Stampfl J, Inst. of Materials Science and Technology TU Wien, Austria) or Self-assembly-based biofabrication (Marga F, Jakab K, Norotte C, Khatiwala C, Shepard B, Dorfman S, Colbert S, Hubbard B, Forgacs G, University of Missouri, USA). The examples of the application and development of these techniques were presented by groups from Wake Forest Institute for Regenerative Medicine, USA (Development and validation of an integrated organ printing system, Kang HW, Kengla C, Lee SJ, Atala A, Yoo J) and Imperial College London, UK (New materials-based strategies for regenerative medicine, Stevens MM). Bioreactor cultivation of three-dimensional tissue constructs allows controlled culture conditions to support tissue growth, to maintain tissue vitality and to induce and sustain tissue differentiation. In order to achieve reproducible culture conditions and results the cultivation process needs to be continuously supervised. Control units and sensor systems enable monitoring of tissue growth and provide data for establishing reproducible culture protocols and procedures. The challenges of automatization of these processes lie in the transfer of biological reactions with high variability into standardized and harmonized procedures for high-throughput tissue generation. Automatization of Bioreactor Technologies for 3D Tissue Cultures session covered the problems and challenges arising when manually-controlled individualized culture processes are transferred into reproducible and automatized cultivation procedures for Tissue Engineering. studies of stem cells, including directed differentiation, expansion and characterization of differentiation capacity. The session included high-quality presentations from different areas of basic and applied research and technology development that can advance and facilitate translation of tissue engineering research into clinical applications. The translational researches, as mentioned already, and trends of clinical applications in the area was the most important and representative part of the congress. Every case of translational research in regenerative medicine covers clinical translation of cell therapy, tissue, organ regeneration and therapeutic biomaterials development. You could see the examples of different approaches performed on the different types of tissues and organs. Trachea/Oesophagus/Chest – Repair and Replacement. Both malignant and benign disorders affecting the thorax can be surgically rejected but majority have an inoperable size at the time of diagnosis. Due to a lack of reconstructive tissue and optimal solutions, new therapeutic options are needed. Recently, tissue engineering and regenerative approaches demonstrated their great potential in both experimental and clinical conditions with respect to several different complex tissues, such as the trachea, urinary bladder, blood vessels, cartilage, skin and heart valves. The discovery of novel mechanisms and technologies will get us one step closer to routine clinical application. Symposia keynote Philipp Jungebluth (Karolinska Institute, Sweden) made an analytical presentation based on the practical things – examples of successful clinical trachea transplantations, made by Professor Paolo Macchiarini and his group. (Tissue engineering – from bench to bedside and back to bench). Key sections on other organs and tissues: Preformed Vasculature and Induced Angiogenesis, Heart, Pancreas, Liver, Bone, Skin Regeneration, Spinal Cord Injury. Such a complicated field requires a lot of analytic work, which were presented in the plenary lectures. The authors tried to show the trends of regenerative medicine’ development. Dietmar W. Hutmacher - Professor and Chair of Regenerative Medicine, Institute of Health and Biomedical Innovation of QUT. He leads the Regenerative Medicine Group, a multidisciplinary team of researchers including engineers, cell biologists, polymer chemists, clinicians, and veterinary surgeons. His team is endeavoring to meet the challenge to provide new bone to replace or restore the function of traumatized bone or bone lost as a consequence of age or disease. Bone tissue engineering concepts developed by his group promise to deliver specifiable replacement tissues and the prospect of efficacious alternative therapies for orthopedic applications such as non-union fractures, healing of critical-sized segmental defects and regeneration. Another key project: Professor Hutmacher’s group has been developed an animal model for bone repair research. Finally, the group is using their expertise in biomaterials & tissue engineering to tackle a different problem: development of 3D cancer models in the lab from scratch. David Kaplan - Professor & Chair of the Department of Biomedical Engineering and also holds faculty appointments in the School of Medicine, the School of Dental Medicine, Department of Chemistry and the Department of Chemical and Biological Engineering (Tufts University). His research focus is on biopolymer engineering to understand structure-function relationships, with emphasis on studies related to self-assembly, biomaterials engineering and functional tissue engineering. He directs the NIH P41 Tissue Engineering Resource Centre (TERC) that involves Tufts University and Columbia University. Ivan Martin – Director of the Tissue Engineering Research Group, Professor for Tissue Engineering, Faculty of Medicine Departments of Surgery and of Biomedicine, University of Basel. His group includes scientists from the biological, engineering and clinical fields, allowing interdisciplinary work with a strong translational component. His research interests are centered on 3D culture systems for mesenchymal cells of various origins, as models to study cell differentiation and tissue development, or as grafts for bone and cartilage repair. Shinichi Nishikawa - Director of the laboratory for Stem Cell Biology at RIKEN Centre for Developmental Biology (CDB) and also Deputy Director of CDB, Japan. The major interest of his group is the molecular and cellular mechanisms governing development of hematopoietic stem cells. While his research interest is diverse, he made important contributions to each field through t works on the differentiation of B-cells, the function of tyrosine kinase receptors of the PDGFR family, the differentiation of hematopoietic stem cells and the development of peripheral lymphatic tissues. Professor Nishikawa became one of the leading stem cell biologists. Clemens A. van Blitterswijk - Professor of Tissue Regeneration at Twente University in the Netherlands, most of his research deals with Tissue Engineering and Regenerative Medicine forming a unique basis of multidisciplinary research between the materials and life sciences. His group got the maximum score of 4 fives in the QANU Research Review Chemical Engineering 3TU (evaluation of chemical engineering), 2010. Now he heads one of the leading European labs in the field of Tissue Engineering and Regenerative Medicine, he combines this task with the scientific directorship of MIRA, a recently established institute for biomedical technology and technical medicine, which will grow to over 400 staff in the coming years. David Williams - Editor-in-Chief of Biomaterials. He has had 40 years’ experience in the biomaterials, medical device and tissue engineering fields. Professor Williams left the University of Liverpool, UK, in 2007 from the position of Head of Clinical Engineering. He is currently Professor and Director of International Affairs, Wake Forest Institute of Regenerative Medicine, North Carolina, USA, and a Visiting Professor in Cape Town, Sydney, Beijing, Shanghai and Taipei. He is President Elect of the Tissue Engineering & Regenerative Medicine International Society. The regenerative medicine as a new field (TERMIS founded about 10 years ago) requires the regulation. We have not the unified rules in different countries so far, that is why the organizers paid attention to this subject inviting the representatives of two most authoritative organizations - European Medicines Agency [EMEA] (D’Apote L.)and FDA‘s Center for Biologics Evaluation and Research [CBER], USA (Witten C). 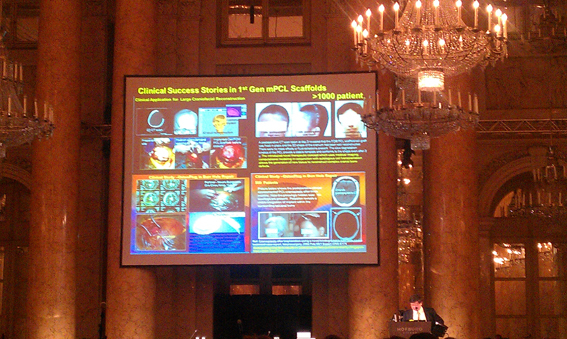 They presented lectures on the regulatory environment of regenerative medicine in USA and Europe. The key point of both presentations: as science (and translational research as well) becomes more international, we need more cooperation and integration in order to unify the rules. The organizers also paid special attention to the students and young scientists and tried to give them an opportunity to learn. There were several special events, like “Meet Mentor”, where the students had a chance to talk and discuss their field of interest and even careers with the distinguish scientists. They also had the opportunity to assist chairing a session with a leader in the research field. The next TERMIS World Congress will take place in September 2015 in Boston (USA).